People have wondered what the good-looking scion of India’s first political family (Priyanka Gandhi) found in a common citizen like Robert Vadra. Perhaps the hand can give us some clues. Priyanka is not aware of his impressionability. The distinctly conic Jupiter (index) finger and thumb clearly point to this. 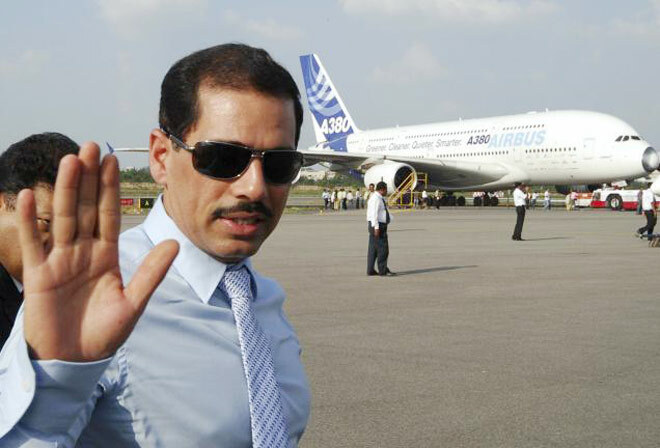 Check out a photograph of Robert Vadra's right hand here. Robert Vadra has good second phalanges, a good length of the Mercury (little) finger, a straightish and slightly high headline, and a strong thumb. All these signs point to a person who understands money. So, while Vadra may be just an average Joe in most ways, where managing money is concerned he is above average. He has an acute sense of how to handle money and yes, his hand shows that he is not entirely straightforward. He is not that straightforward either, and it is not surprising that he used Priyanka’s contacts profitably. He is also strong-willed, evident in the long will phalange, which means he likes to get his way. And he may not be reasonable about it. He is likely to be a bully. When Robert Vadra wants something, he goes all out to get it. It is unlikely that Priyanka Gandhi would be able to control him. This explains why he lost all sense of proportion when he started to exploit his proximity to the Gandhi family (reportedly). This extreme wilful nature, which sees neither logic nor reason, is not a good sign in any person in a powerful position. Of course, this also means that he lacks true business ability. A good businessman takes calculated chances, and is not impressionable or idealistic or unreasonable. Therefore, on his own, without contacts, it is likely that Vadra would not have been able to make too much money. What did Priyanka see in him? Rober Vadra was neither rich nor famous, like her. It is quite possible that Vadra is not the type who can take no for an answer. Maybe it was his persistence which got him what he wanted. Also, she must obviously have found him attractive. Or check out the personality characteristics of Businesspeople from around the world. I sometimes wonder how, the children of two-strong willed people, is not as strong-willed as their parents. Does this reflect on the kind of upbringing? Personality is a result of genetics and environment. Genes for a particular feature, either of personality or body type can be inherited from anyone, not necessarily the parents.This is because genes work in combination with the genes of the other person (mother or father). The dominant gene wins (this is not referring to a personality trait but a characteristic of the gene itself) showing up the trait. However, the passive gene (characteristic of the gene) remains in the person and can be passed on to the next generation. Whether it becomes dominant in the next generation depends on the genes of the mate. At times passive genes can be passed on for several generations without them showing up. So genes can come from anywhere from our ancestors although the liklihood becomes less with every generation. If you are referring to Rahul Gandhi, yes his hand shows a weak personality. Even if he inherited it, his environment has done nothing to make it better. I think their upbringing must have been a protected and pampered one because even Priyanka's hand is not a good one. i think both rahul and priyanka seem to be at an equal .standpoint on the intellect level..even tho priyanka being more pushy...and manipulative can sought of appear to get things done.rahul just suffers more on the pretext of being unable to express his thoughts....clearly..and i dont want to be one of those people who like to pin down politicians ...to make themselves feel better...but lately..he actually has shocked even the worst of his critics..i wonder whats wrong with him..how can he lose his train of thought so easily..its one thing being shy or under confident...but its just appalling...how he has made a complete mockery..of the whole campaign....and on ur point of inheriting characteristics...well to be fair to both of them..their parents weren't so sharp either...come to think of it ..u have read both of their hands..i think rajiv gandhi to some extent still had the ability to analyse perhaps think reasonably...more than his children culd ever evolve into...but he had his issues with self doubt as well...although he wasnt afraid to take chances or plunge into scenario's...that culd perhaps make the difference...its sad none of his children have developed this trait.. ..i think rahul has inherited characteristics more on his mother side...and also.i have noticed.that none of the gandhi clan right from indira gandhi..perhaps jawaharlal nehru...and rajiv to rahul..had reasonable thinking abilities ...none of them have developed saturnian qualities like seriousness or application ..they all seemed to have taken it for granted for so many years...just wishful thinkers dreamers...taking the whole nation for a ride ...especially if u consider the fact that they dont belong into a set-up which they perhaps just accidently stumbled upon ...and cannot remotely handle the responsibility that comes along with it..
u know normally i just prefer to conveniently... put across a point and await a reaction...but i guess.. u preferred to ignore this time clearly i didnt make sense at certain..points..or maybe my analogy..doesnt strike across as any more than a cynical reaction...i might have not explained certain basis of my observations..but i do believe the gandhi clan was and still is oddly complacent of their role in indian politics..sorry if i sound dumb.. I did not ignore you comment Amandeep. And no, you do not sound dumb at all. It was an interesting viewpoint and observations. However, there is no question to answer and nothing I can add to it. ok what signs shows bully nature , and one more thing, u are saying that he easily carried away by anything and on other side u r saying that he has strong willpower and gets what he want, how it is possible ?? Yes Zaineb, he is impressionable and he also has strong will power and likes to go after what he wants. These qualities are not mutually exclusive. About the signs which show a bullying nature, it is the combination of signs that one has to see. 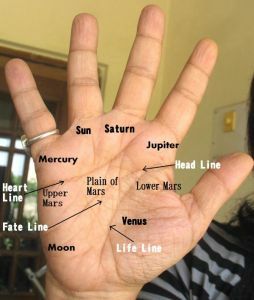 The strength of the Mars mounts, the length of the thumb, the length of the phalanges of the thumb and their shape, the length of the index finger and its setting, the stiffness of fingers, skin quality, etc. One has to examine all these signs carefully, and then decide whether the person is a bully or not. Hand reading is not about one sign or mark but all about the art of reading from a variety of signs. However the choice of your words "easily carried away by anything" is a little odd. I never said those exact words. I said " he is likely to get carried away by an aura around a person" and this means impressionable. Robert Vadra is certainly that, and also very wilful. Your words better describe a teenager or an adult who is very fickle. thanks for ur comments !! i really like the way u explain the things !! A cousin of mine, during her 3rd year had touched a pressure cooker with her palms resulting in bruises on the Mounts & heart line and now she is 23 and very recently I had seen her palms where I am surprised to see the same brunt scars still existing resulting in the absence of heart line in the hand. Due to her soft skin texture the other lines are also invisible. What is your opinion on such bruises/ cut/ wounds where the lines are not visible since I had come across in a book where it was mentioned that lines can overcome such things and appear in hand. Request you to provide your insights. The lines come back if the wound is not deep. Amitabh's Bachchan had burnt his hands but the lines came back. It depends on the type of wound. If nerves are destroyed and it is a deep wound then the scarring means that the lines may never come back. This is not my opinion as this is a medical issue. However you have to be sure that the heart line is indeed missing as a result of the burn or whether there was always a problem with the heartline. Ma'am, the wounds had concealed the line because i could see a small portion of line near mercury finger! !